The National Chairman of the Social Democratic Party of Nigeria (SDP) Olu Falae has slammed the Buhari administration for failing Nigeria in the areas of security and the economy. Falae, who bemoaned the continuous and wanton spate of killings around the country, said he had expected President Buhari to critically appraised the current situation in the country and declared he would not seek re-election in 2019. He noted that, though the President is a good friend of his, he was duty-bound to point out any government that failed to protect the lives of its citizens, and that based on that President Buhari should be voted out of office. False urged Nigerians to come together and do everything possible to ease out the APC-led government for the President’s sake and that of Nigeria. The politician made the remarks in Abeokuta, the Ogun State capital, while fielding questions from newsmen, shortly after he emerged from a closed door meeting with former President Olusegun Obasanjo. 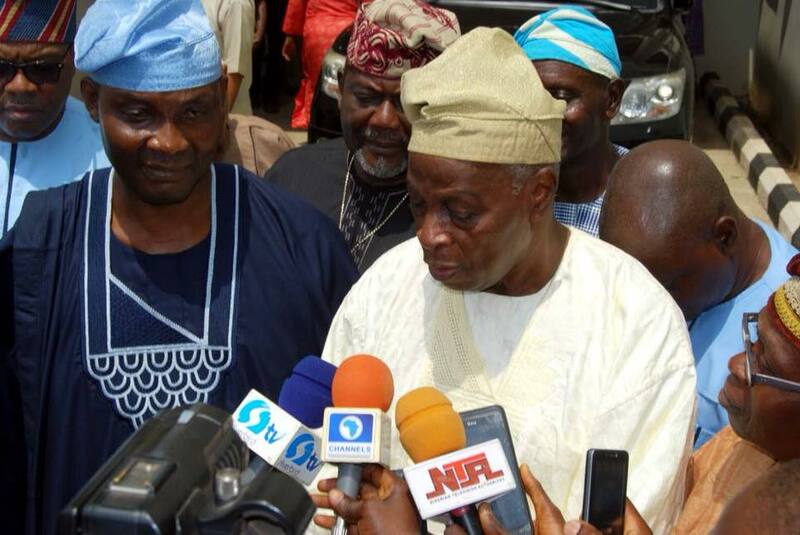 Disclosing that he was in Abeokuta to see Obasanjo about the country’s state of affairs, Falae emphasised that Nigerians must unite in effecting the real change. “I am here to visit Papa Olusegun Obasanjo, former head of military government and former president of Nigeria and who was my boss when I was the Permanent Secretary at the Presidency. I have to come to see him about the affairs of Nigeria. “The affairs of Nigeria are greater than the political ambition of anybody. So I am here to exchange views with Baba Obasanjo on the affairs of Nigeria. Once upon a time between 1977 and 1979, I worked with him, he was the military Head of State and I was a permanent secretary working with him. And we did many things in those days to advance the course of Nigeria and the way things are in Nigeria, I think should come back to see him, to exchange views with him to see whether we can make any contribution towards the elimination of the threat that we are now facing. “You know and I know that the present government has not done well. The primary responsibility of government is to protect the lives of its citizens. This government is not doing so. People continued to be killed and slaughtered every night. “Any government that cannot stop that has failed. President Buhari is my friend. Once upon a time you will recall that I raised his hand at the Adamasingba Stadium in Ibadan asking people to vote for him because he said he would restructure Nigeria. “So it is not a personal matter. The truth of the matter is that he has not done well and I was hoping that he himself will look at the situation as a very honest and right thinking person and do himself and us a favour by saying that in the light of what has happened and giving the state of affairs, he is not going to contest. That’s what I thought he would do but he didn’t do so. “We need a change from massive unemployment which we have now. A change from continuous harassment from killing of people by Fulani herdsmen. A change from the fear and threat of Boko Haram. A change from a situation where farmers are afraid to go to their farms. A change from the riots that are all over the place because of frustration and loss of hope. A change from the present situation of depression and failure and revival of the economy of Nigeria,” he stated. No. Let him come out. Nigerians are waiting for him . Blood sucker. Let him stand on the mass graves of innocent nigerians he killed with his fulani terrorists ( herdsmen) and campaign for re election. Wicked ruler. Tell me the state in Nigeria that has not been attacked by these FGN backed herdsmen? Heartless Fulani herdsmen grand patron seeking re election? Another 4 years to complete his genocide? God forbid.